James Perry is the owner of James Perry Exam Coaching, a unique business, coaching Accounting Students on mindset, motivation, study and exam technique. To date he has successfully coached over 80 people globally including Cyprus, Jamaica and even New Zealand! He has built his personal brand from scratch and advises others how to do this and is seen as an influencer both within and outside of his sector. When James is not working on one of his businesses, he can be found acting as a consultant with ALPS talking in primary schools about emotional wellbeing, organising and hosting networking events to raise money for charity or speaking at local schools about entrepreneurship on behalf of Young Enterprise NI.On top of all this, James is a carer for his Dad, finding himself in this position for the second time in his life. James is proud of both his professional and personal achievements and dedicates everything he does to his parents, especially in memory of his late mother, who was his inspiration. Andrew Gilpin has worked in the finance sector for over 16 years. Back in 2002, he joined PwC, one of Ireland’s ‘Big Four’ accountancy practices, where he trained and practiced as an Accountant. In 2007 he completed his studies to qualify as a Chartered Accountant. He joined the team at WHR in 2009 and has remained there ever since. Andrew is a Director within the practice.WHR Accountants is an independent accountancy business based in Armagh city. The practice has existed since 1985 when it succeeded Lennon, Gray and Wilkinson. Each of the directors have trained in a 'big four' firm but now ply their trade in the more approachable and personal environment that WHR offers, providing an excellent service with value that their clients appreciate. The practice has grown over the years from a small accounting service business to a sizeable team of 12 accountants who provide small and medium size enterprises (SME`s) with support in a number of key areas. These include audit and assurance services, accounts preparation, business planning, management consultancy, management information systems, taxation advice, payroll, VAT and book keeping services. WHR has also developed a specialist Wealth Management division. The majority of WHR’s clients are based locally in the Armagh, Craigavon, Portadown and Dungannon areas but the team welcome clients from all over the UK. Andrew’s areas of expertise are taxation, accounting and business management for small to medium sized businesses. He has built up good relationships with his clients during his time with WHR, and works hard to gain a good understanding of each client’s business. He aims to explain things in such a way that his clients can understand their tax affairs and accounting needs more fully. Andrew has a busy life outside of work. He has a young family and also enjoys playing sports including running, football, golf and swimming. He completed the London Marathon this year again, raising over £4,000 for The National Autistic Society. 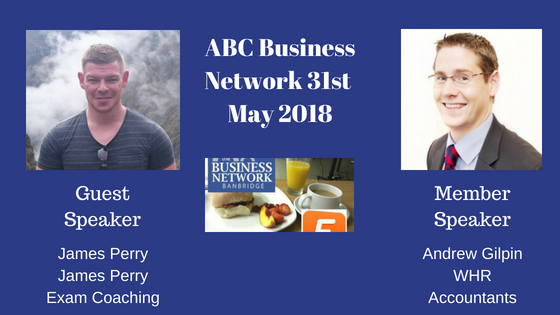 He’s also involved with his local Church and is an officer in the Boys Brigade.Andrew will tell us more about his work within the finance sector, and outline some of the financial challenges facing SMEs at present. He will also provide some advice on getting your business on a sound financial footing to support its long-term growth.